Lead-Free. One (1) glass per order. 9 1/2" height, 7.4 oz. The Zalto Denk'Art Champagne glass is recommended for Champagne and Sparkling wines. The development of the Zalto Denk'Art series was influenced by the earth in accordance to the tilt angles of the Earth. Thus, the curve of the bowls are tilted at the angles of 24 degrees, 48 degrees and 72 degrees. The Zalto Denk'Art Champagne glass is recommended for Champagne and Sparkling wines. Created for Champagne, Sparkling Wines, Prosecco, Spumante and Cava. Lead-Free. Dishwasher-Safe. Dimensions: 9 1/2" height, 7.4 oz. would it be advisable to put these in a dishwasher? 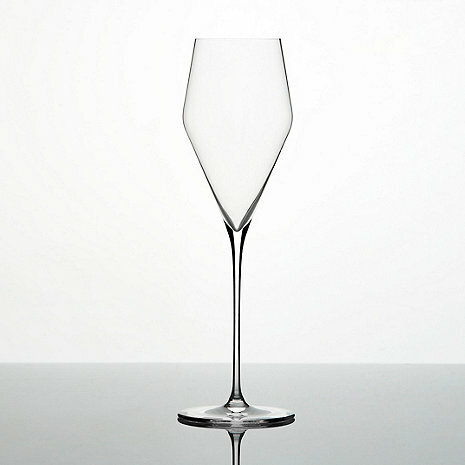 BEST ANSWER: The Zalto Denk'Art Champagne Glass is mouth-blown, lead-free and dishwasher-safe. Are these from the champagne glasses from the company in Austria? BEST ANSWER: Most certainly not. They are made in China. They are from the company in Austria....NOT China. Please look at the Q & A for the Bordeaux glasses as a staff member answered this question. These glasses ARE hand made in Austria. They are not from China. A quick google search will confirm. We love these champagne glasses! They get people's attention because of their shape, and then when the glass is picked up, one recognized how finely made they are. Love these glasses; they are gorgeous and of very good quality. Gorgeous glass that highlights fine champagne. So thin and beautiful. Worth the price. A very elegant look and feel. The glass design enhances the wine's aroma and the bubbles appear gentle and persistent on the palate. I have seen the difference my other Zaltos glasses made in appreciating the nuances of aroma and flavor, so I decided to try the champagne glasses, and they definately enhance the experience of a good sparkling wine! Zalto makes amazing glasses that feel right, handle the champagne perfectly, and support the quality of the grape. A most beautiful glass that emboldens the feeling of luxury. Many people that rate this low do so on the grounds that the glass is “too fragile,” but that just simply isn’t true. Yes, the glass is thin and delicate, but with the proper care this glass should last you a long time. Very happy with it. Love all zaltos, especially this one. Perfect for champagne and other light zippy whites. Going to order another pair right now! have a collection of high priced very good fluted. These are lovely to hold and add to the flavors and textures of the Champagne. Need to be handled gently but worth it. They are light and have perfect balance. My new favorite flutes! Lovely glasses that enhance my enjoyment of the champagne! Zalto glasses are very good but they are too expensive.